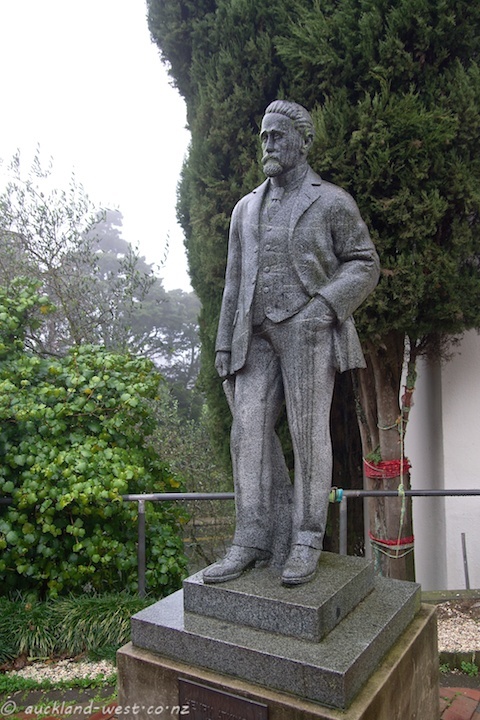 … Henderson. 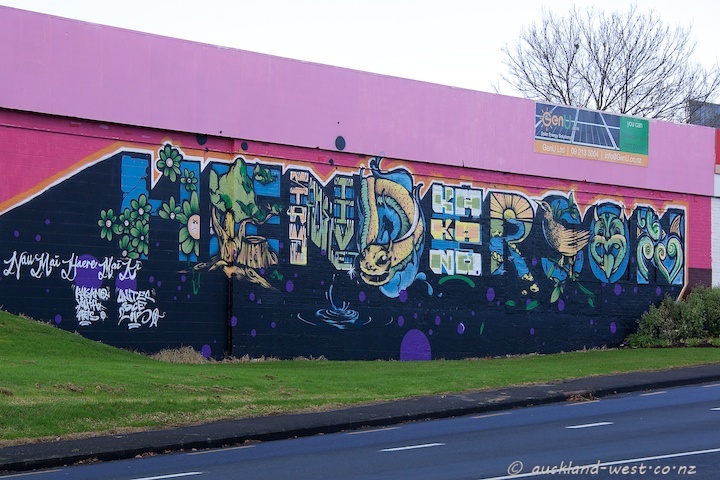 A big mural has gone up recently along Alderman Drive, Henderson, at the corner with Great North Road: Welcome, welcome to Henderson! 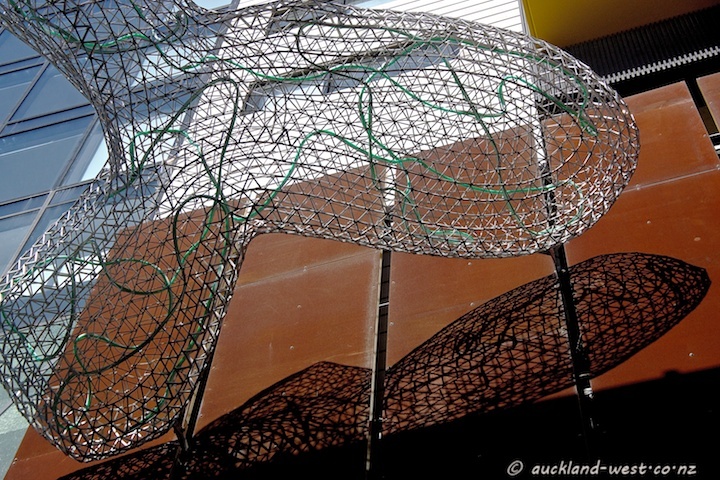 It is signed “Kakano Youth Art” and “Unitec BCE 2015”. 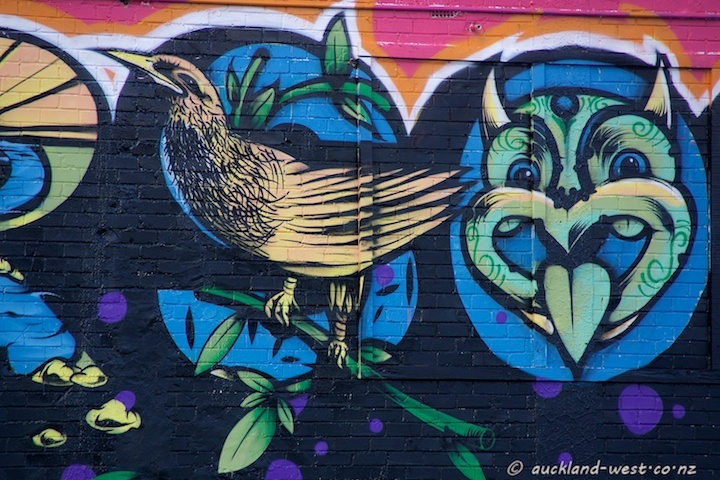 On the link we are promised four high profile walls – will have to keep my eyes open for more fine work to appear! That was the theme of yesterday’s fundraiser by the Titirangi Potters Club at the monthly Titirangi Market. Not only was there a range of delicious soups – but you got to keep the bowl. Over the past weeks, the club had been busy making bowls (and plates, so that people like myself could take home a load of home baked biscuits), with all proceeds going to the Himalayan Trust‘s Rebuild Appeal. Great initiative! 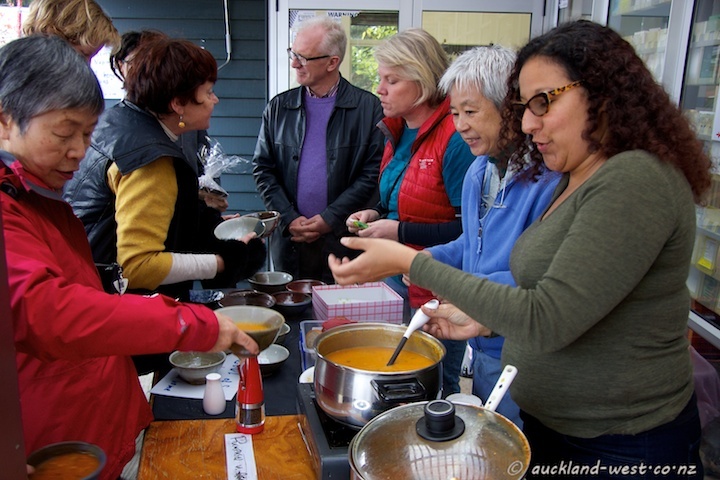 In the picture from right: Gladys, Mariko, Ute and Richard (members of the Titirangi Potters Club) with customers. 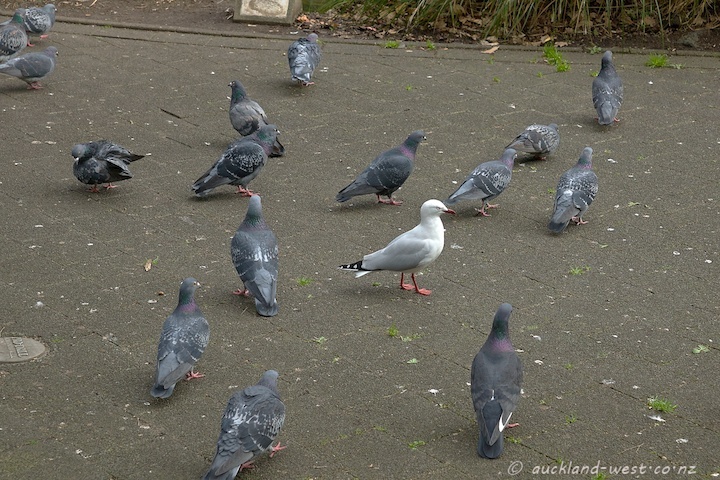 A gull among the pigeons. 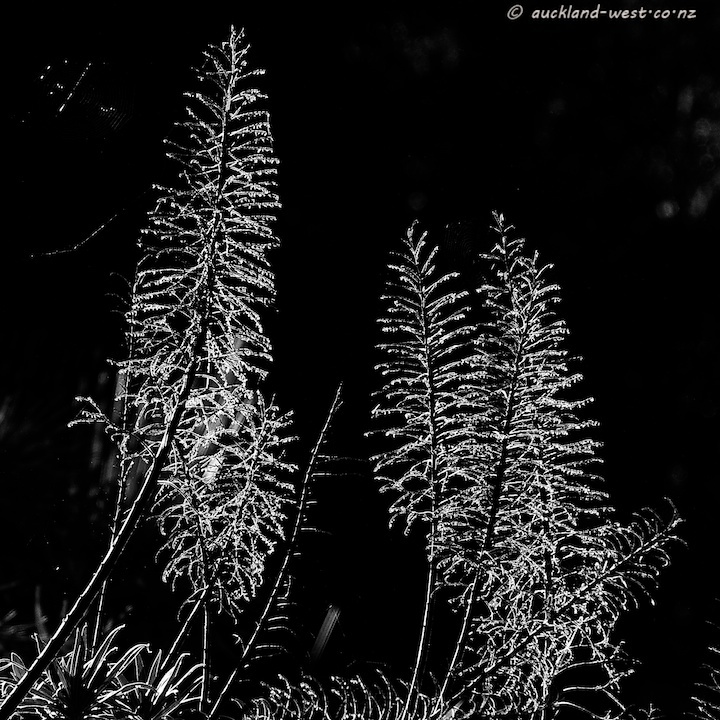 I think they are what is left of the flowering stalks of an echium plant – inconspicuous most times, but the low morning sun lifted them up out of the dark background. 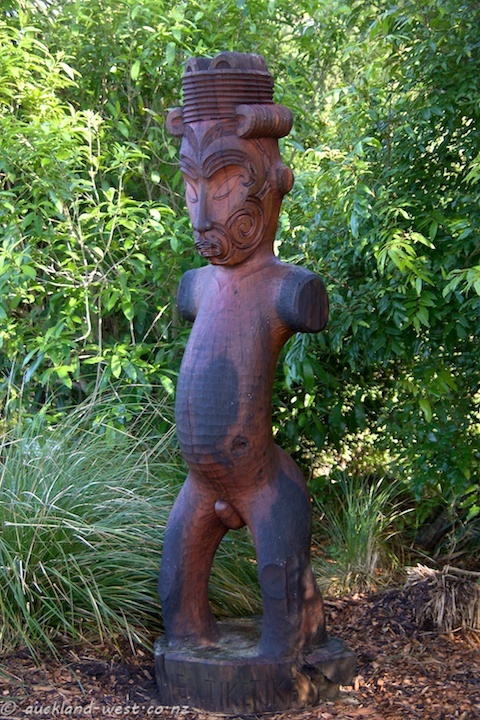 Forest Hill Road, Waiatarua. 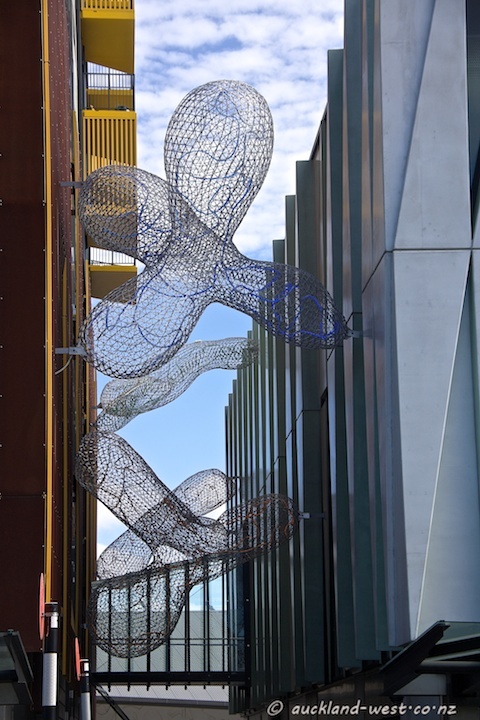 This work by Gregor Kregar consists of four cloud-like forms arranged between Totara Health and the McCrae Way carpark in New Lynn’s Merchant Quarter. 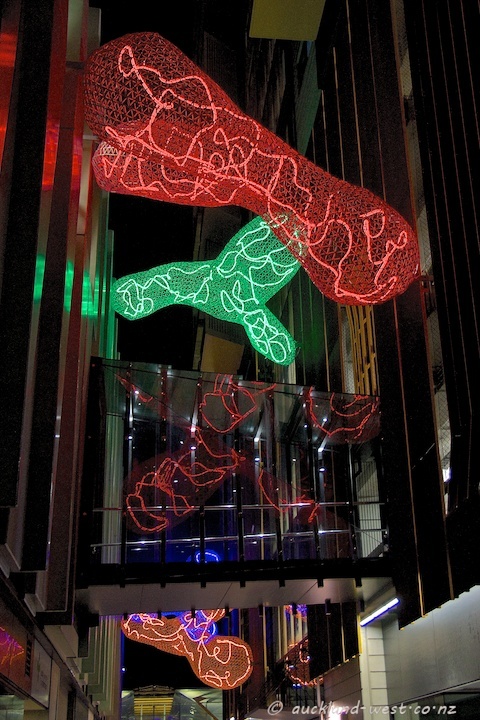 It illuminates a narrow alleyway leading from the library to the New Lynn Train Station. A lot of discussion was had when the sculpture first appeared, centering on the phallic aspects of the piece and on the budget. 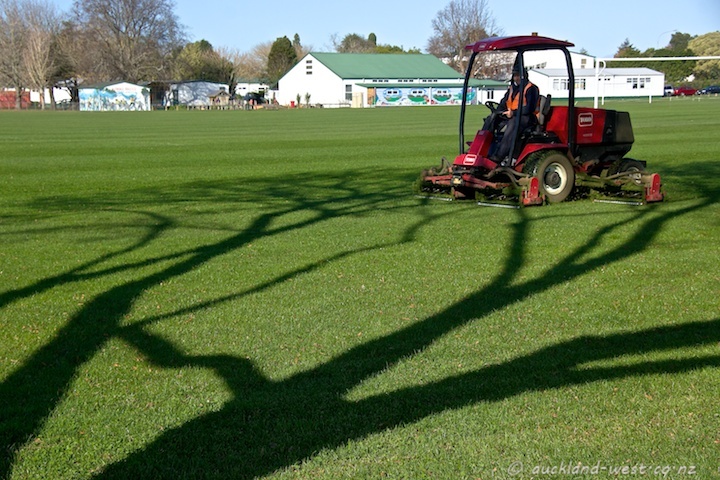 After what was the coldest night so far (frost in some sheltered places) a mower takes to the green fields (and the shadows of the trees) at Avondale’s Eastdale Reserve. 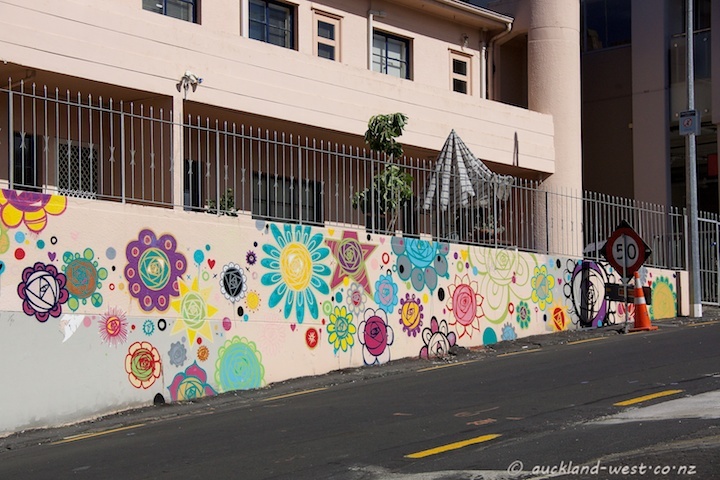 A mural in Poynton Terrace by Charles and Janine Williams, created in the 2014 All Fresco Festival (K-road Business Association). 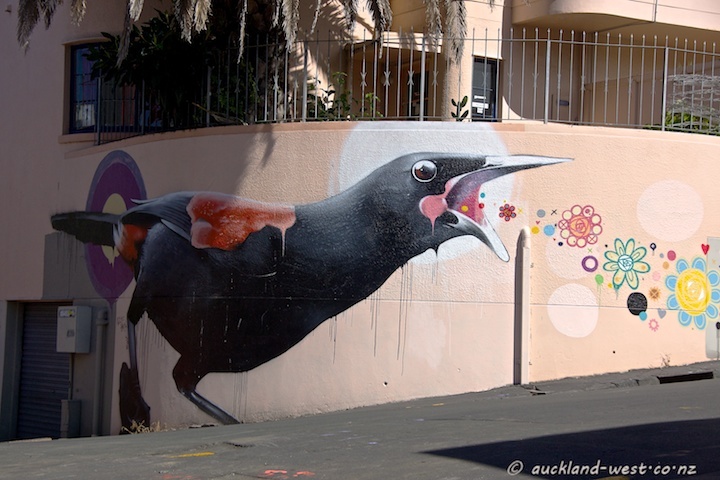 This bird is native to New Zealand, and major conservation efforts have taken place to bring its conservation status from ‘rare and endangered’ to ‘at risk – recovering’. You can hear the song of North Island and South Island saddlebacks here (search for “hear the song”). 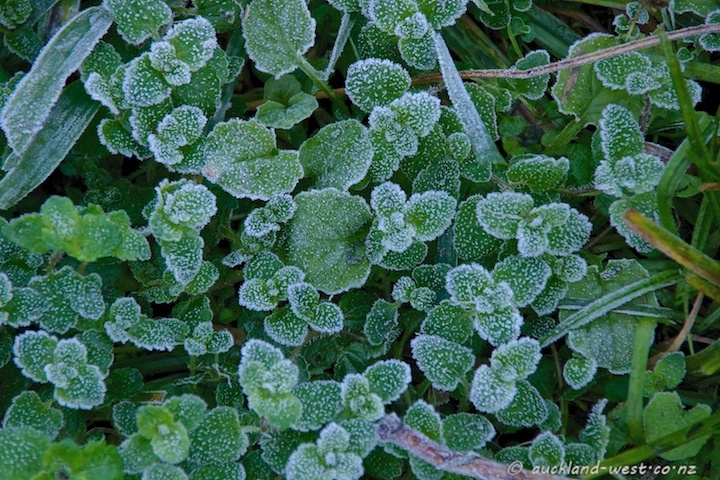 The name ‘Titirangi’ is often translated as “Fringe of Heaven” — and on Saturday, barely a day before the solstice, that fringe hung deep into the top of Titirangi. Mist and rain being the order of the day. 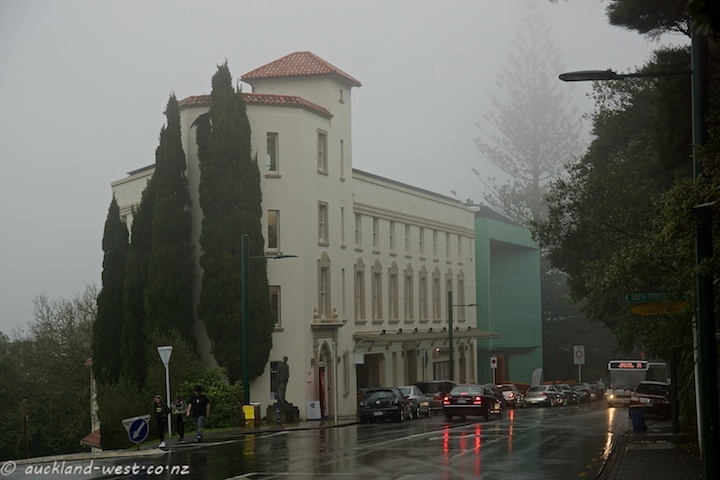 Here the landmark Lopdell House with the Deco Eatery – a welcome refuge in that kind of weather – and the green cube of Te Uru Waitakere Contemporary Gallery. 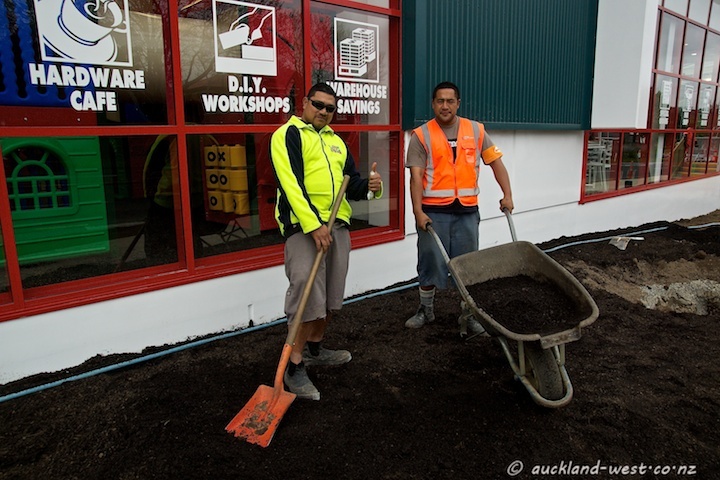 The Bunnings Warehouse at the corner of Titirangi and Great North Roads is going to open soon. These guys wanted to have their picture taken as I walked past with a camera. 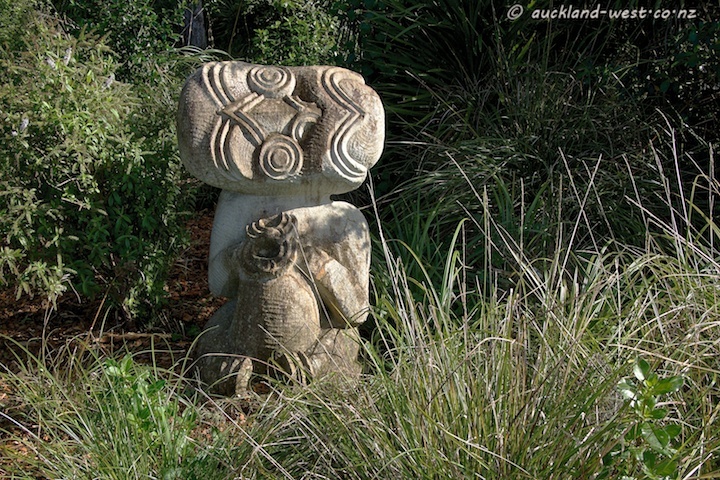 Done in a flash, and on they went, finishing the planting along Titirangi Road. Edit 22 June: The store opened today, see their website for opening hours and details of the Grand Opening this Friday and weekend.